Pfister is one of the brands that have been on the market quite a while. For more than a century, they have been producing prime-quality faucets and showerheads to meet the highest standards in the bath and kitchen industry. 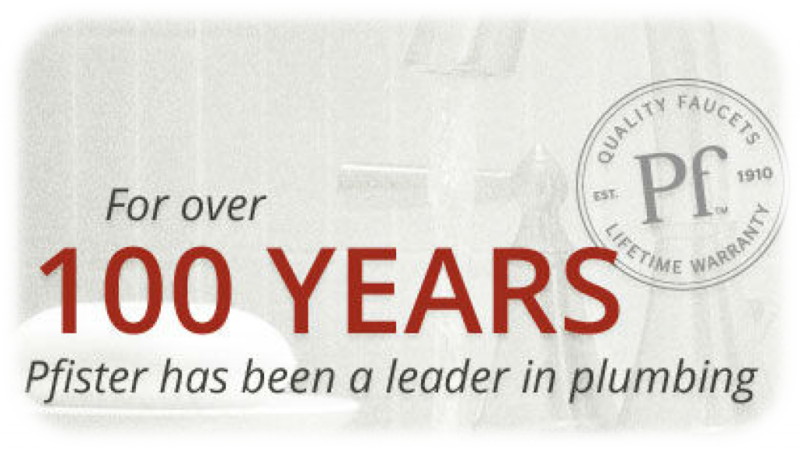 Since 1910, Pfister has been a leader among the manufacturers of plumbing products and accessories. Since the foundation of the brand, Pfister has earned eighteen awards for the excellent design of their products. Today, their produce encompasses 82 collections. Their faucets and showerheads come in a wide array of finishes with the total number of twenty. They have a line of WaterSense-certified faucets that can help you save up to 30% of water. One of their main contributions to the industry is the introduction of the lifetime warranty. Inspiration and innovation are among Pfister’s highest priorities. They create interesting and unusual design options in three most popular styles—traditional, transitional, and contemporary—to bring a luxurious feel into any household. Speaking about innovations, the members of the brand do their best to improve the technology, providing more convenience to the consumers. All showerheads and faucets from Pfister are high-quality products that will serve you for many years. Choosing Pfister, you choose reliability, durability, functionality, and design—all combined into one. Initially, Pfister was called Price Pfister by the names of the two founders of the brand. The company was established in 1910. Their very first product with which they entered the market was the garden faucet. During the next decade, the brand expanded the product line by including such fixtures as bathroom and kitchen faucets, valves, and hose nozzles. 1930 brought with itself a true innovation—“Make a Shower”. This fixture allowed for an easy converting any bathtub into a tub/shower combo. This invention was a real breakthrough on the market of bathroom fixtures of the time. Another important innovation that turned showers into a much more practical and convenient place was the invention of the single control shower handle. It allowed adjusting both water temperature and water flow volume, making showering much more comfortable. Equally important were the changes in the field of design. In 1975, Pfister’s designers created translucent colored handles that became a real novelty and brought a fresh accent into many bathrooms throughout the country. Apart from that, the brand offered more finish colors to the consumers. They also did their best to make the latest design decisions accessible for every household, producing the most affordable pull-out faucets. The 1990s brought around two big inventions that made a real change in the production of kitchen and bathroom fixtures. It was the creation of the Pforever Seal and the Pforever Finish. The Pforever Seal technology was the first that used ceramic cartridges as the main component of the faucet construction. It allowed the brand to introduce the first lifetime guarantee against leaks and drips. The Pforever Finish was also created to increase the durability of the products, making them scratch-, tarnish, and rust-resistant. In 1997, the brand offered to the customers another important creation—an integrated filter. Pfister was the first in the industry to produce faucets with a built-in filter. Prior to that, filters had to be bought and installed separately. With this invention, getting pure water became easier than ever. In the 2000s, with the beginning of the age of new technologies, the brand’s professionals started searching for new ways to impress the customers and competitors. They expanded their line of products by introducing a volume control sprayhead, a wall-mount trough faucet, an improved drain assembly, and an adjustable height pull-out faucet. Today, Pfister is working to create kitchen and bathroom fixtures that are safe for health and for the environment. Their line of lead-free products meets the latest standards concerning the limitation of the amount of lead to minimize the harmful influence of heavy metals. In addition to that, Pfister was one of the first to team with the Environmental Protection Agency and start creating water-efficient faucets and showerheads that meet the WaterSense standards. 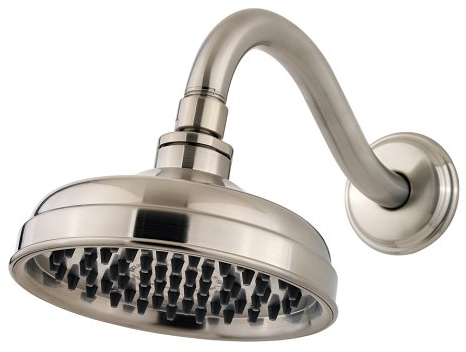 This deluxe showerhead will bring a special embellishment into a bathroom of any décor. It is available in three finish colors—sleek brushed nickel, versatile polished chrome, and intriguing Tuscan bronze—to match any bathroom setup. The elegant lines and ornamentally situated spray nozzles make this handheld shower pleasant to touch and to look at. Apart from being beautiful, the Avalon showerhead can offer high functionality. It comes with three spray settings to offer the most optimal showering experience. Invigorating spray is great at relieving tension after a hard day. Invigorating and pulsating spray uses direct pressure to stimulate specific points on your body. Rain spray is soothing and relaxing. This decorative showerhead will enhance the design of any shower. It comes in three finish colors—bronze, brushed nickel, and polished chrome. Coming with a matching shower arm and flange, it is a fully assembled shower fixture ready for the installation and use. It can be easily installed in just a few minutes. 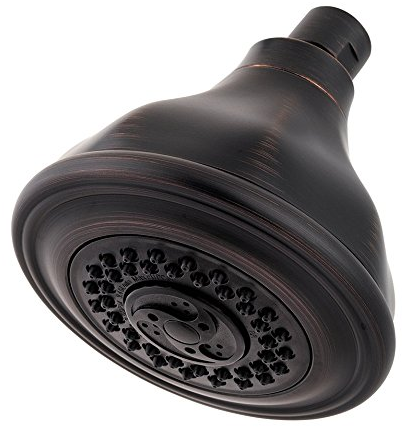 The Marielle is a self-cleaning showerhead that will save you from all the rubbing and scrubbing. Made of high-quality rustproof brass, it can offer many years of durability and fault-free performance. In addition to all those advantages, this performance-optimized model will help you use less water. Like most showerheads from Pfister, this stylish model is available in three finish colors—brushed nickel, polished chrome, and Tuscan bronze. Similarly to the Avalon showerhead, this unit comes with three water supply modes—rain spray, invigorating spray, and the combination of the invigorating and pulsating sprays. The Sedonna showerhead has a sophisticated and elegant look. Its style is transitional, making it a perfect match both for classic and for modern bathroom setups. It has a bell shape with soft lines that look decorative and refined. This showerhead will upgrade the look and performance of any shower. This showerhead will turn your shower into a luxurious spa. With six spray settings, it is functional enough to satisfy even the most demanding customers. Apart from the standard rain, invigorating, and invigorating/pulsating spray settings, it comes with such water supply modes as champagne, champagne/rain, and pause. The Dream showerhead is one of the most affordable multifunctional showerheads available on the market today. Its price is comparatively low thanks to the choice of the material. 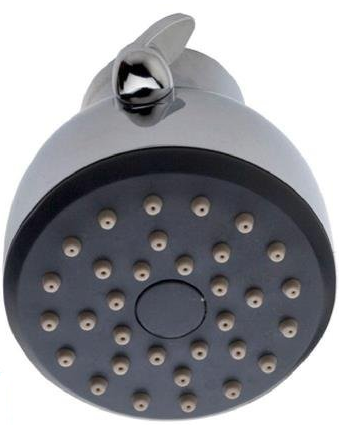 The showerhead is made of high-quality plastic coated with a long-lasting finish. Plastic might not seem the most durable option, yet it is quite a popular material when it comes to the bathroom fixtures. This showerhead has multiple advantages. It is WaterSense certified and meets all the standards of water conservation. 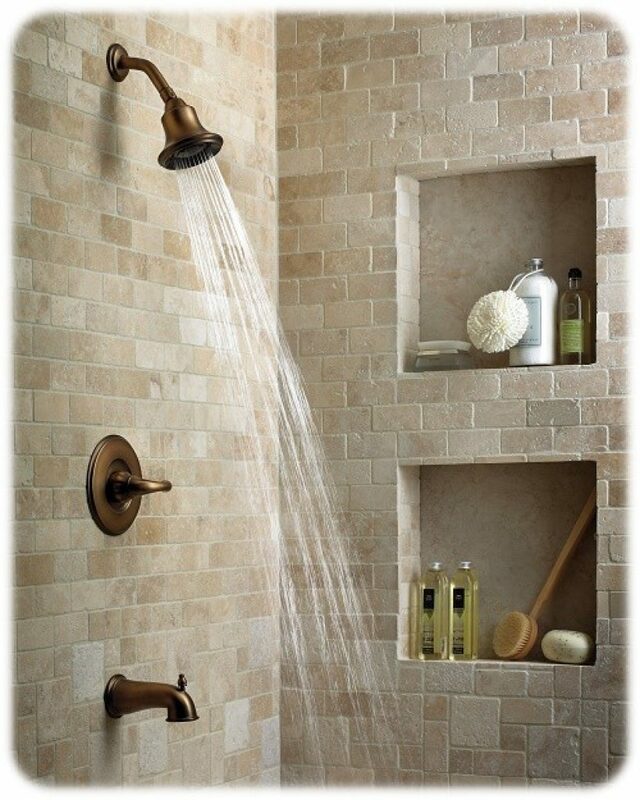 It can help reduce the amount of water used in the shower up to 30%. It also looks quite stylish, with its neat bell shape and its glossy polished chrome finish. 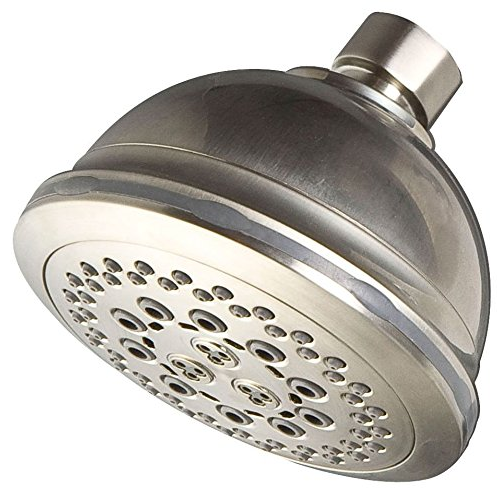 The Bell showerhead from Pfister is one of the cheapest water-saving showerheads you can find. Yet, the low price of this model does not affect its performance. It will be a perfect choice for those who are looking for an affordable single-function showerhead with a water-saving feature.